Having last graced Etruria Beat with his excellent ‘Peruana’ EP, backed by remixes from Twr72 and label boss Luca Agnelli and following a strong release on Pfirter’s MindTrip imprint; home grown talent Diego Amura returns to the label with his ‘Phalaina’ EP, featuring two new originals backed by a brace of heavyweight remixes. The title track with its violent kick and rough bass receives not one, but two remixes from UK techno pioneer Ben Sims. Two different interpretations in his Spacey and Jackin’ remixes that both deliver intense grooves, spacey synths and thumping beats. 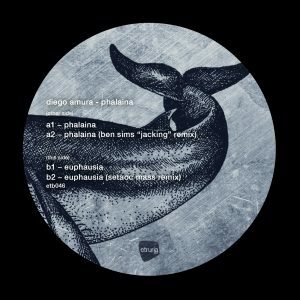 Diego’s ‘Euphausia’ with its strong 909 groove and hypnotic flavour is reworked by Figure, Clergy artist and SK_eleven boss Setaoc Mass, who delivers a stripped, but imposing offering that will ignite any dancefloor.